During a ten-year period, Michael Singer worked on the design of a twenty acre site in Southern Vermont, constructing a pond, changing topography and re-naturalizing plantings. The long-term project culminated with the design and construction of a pavilion overlooking the pond. The twenty-acre site is accessible on pathways through farm fields. Large quantities of earth removed for construction of the pond were used to build a small hill at the northern end of the pond, while the pavilion is built at the southern end of the site. A low-ceiling entryway opens into a 14’ x 20’ room extending over the pond edge. 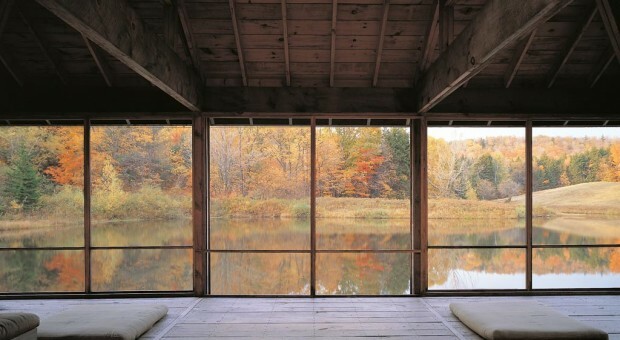 Built of thick wooden planks, glass and screening, the pavilion also contains furniture designed by Singer.